This section of Mandala, Animal Liberation, features stories of your work to eliminate suffering for all sentient beings. The students and staff of Mahamudra Centre in New Zealand had an incredible experience just a few days after Christmas. We got a call that there was a pod of pilot whales stranded on a beach nearby, and Ven. Nangsel, the director, the rest of the staff and students, and I spent hours pouring water over them to keep them cool and wet until the tide came in close enough so that we could swim them out for release. It was an amazing experience, although I discovered that monastic robes are not the most convenient outfit in which to guide/wrestle a 20-foot whale out to sea! It was an extraordinary experience. Of course, I hope it never happens again, but I feel fortunate to have been able to help, to be so close to these incredible animals. I kept meditating on compassion the whole time, although at times it was so sad and overwhelming! Some died before we arrived, but we were able to keep the others alive until we could release them. 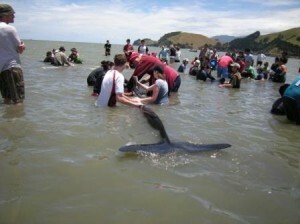 Over 100 people rallied to help save these animals, which are sacred to the indigenous Maori people. It was human nature at its best, with everyone from toddlers to grandmothers working harmoniously together to save their lives. Lama Zopa Rinpoche has taught extensively on methods for benefiting sick and dying animals. Liberating Animals (book) and Recitations for Animals (CD) are both available through the FPMT Foundation Store.